Summary: Skin problems don’t begin in the skin. They begin inside your body. If you’ve got spots and blemishes on your skin, it is a sign that your stomach, liver, and bowels are not in good condition. The good news is, if you have poor skin, you can rebuild it. It takes 30 to 45 days for new basal skin cells to move to the surface and become the cornified layer, which is the skin we see. Make changes to your lifestyle now, and you’ll notice the results in your skin after about a month. When construction workers build a new house, they start at the basement, not the roof. If you want to have beautiful skin, you must start at the basal layer and provide your body with the right materials for building perfect new skin cells. Skin cells created under poor conditions have abrasions, discoloration, and age spots. You might think that age spots and blemishes occur because of damage that happens on the surface of the skin, but usually the trouble begins when the skin cells are being formed in the basal layer. Changing your skin begins with changing your diet and lifestyle. If your skin needs improving, begin by improving what goes into your body and give it the best ingredients for making healthy skin cells. People usually accept poor skin as a part of aging, but your skin can look healthy at any age. 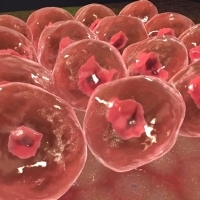 Leviticus 17:14 says, “For the life of all flesh is the blood thereof.” Science has shown that the body is able to convert skin cells into blood, when necessary. A study done at McMaster University found that it is possible to turn skin into blood without the skin cells first returning to the stem-cell state. So, if you’re not giving your body the right materials to build with, the body will use skin cells to make the cells it needs. When your body uses skin cells as basic building materials for its other organs, your skin may look tight, discolored, or old as a result. Your largest organ—your skin—plays an important role in your body’s excretory system. When your colon and other excretory organs are not doing a thorough job of removing waste from your body, your skin begins to do more of the waste removal work. Acne, pimples, and blemishes result from waste passing through the skin’s pores. Unhealthy eating and poor elimination of the body’s waste cause the skin to look unhealthy and old. Remember, if you wouldn’t eat it, you shouldn’t put it on your skin. • Antioxidants not only repair the skin but also slow the aging process while feeding and protecting the brain from free radical damage. • Vitamin D3 helps the bones to build healthy blood cells but also helps to strengthen the immune system and lift the spirit during winter months. If you’re outside 15 minutes, you get 10 000 IU of Vitamin D. In winter when you don’t have enough sunshine, start supplementing. Rudy Davis, ND, recommends 10 000 units of Vitamin D3 per day. • Fiber helps keep your colon clean. Waste materials from all over the body are deposited in the transvers colon. For perfectly healthy skin, keep your bowels moving and your internal tissues clean. • Vitamin E oil is one of the most potent antioxidants that you can apply externally, feeding your skin from the outside in. - To remove warts, apply three times per day until the wart is gone. - Apply undiluted to remove sun spots. - Rub on stretch marks to repair them and new cell growth. Up close, skin cells look like they have little mouths. 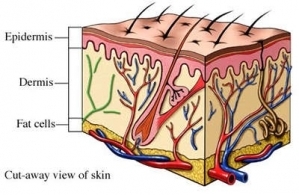 Those pores are holes that go inside your body. When young woman was covered in gold paint for a movie part, after only a few hours, she had to be taken to hospital. Another young woman took her place on the movie set. This time, a small area of skin was left unpainted just to keep her alive. Even so, she only lasted a couple of hours before she too began to get sick and had to be cleaned off. This story shows how important it is to keep your pores unclogged. Did you know that 80% of house dust is made up of dead skin cells sloughed off by our bodies? 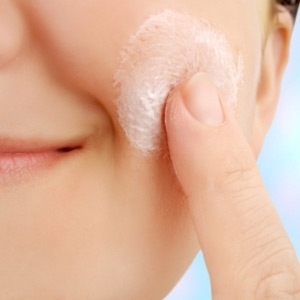 Dead skin cells must be removed daily to keep the skin clean and the pores open. You might think that the best way to be clean is to use lots of soap and water. But, when you put soap on your skin, the soap creates a film through which dead skin cannot slough off. Soap also causes your skin to feel tight and forms a layer of material that prevents skin from breathing. • Removes dry, dead skin cells. • Helps to keep pores unclogged and open. • Allows skin to breathe properly. A massage therapist who knows the skin can help you rebuild elastin, fibrin, collagen, and the fibroblast cell. Proper skin massage stretches the skin and provides small breaks in the elastin network. 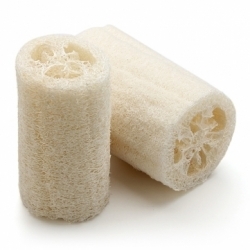 This causes the blood to produce more fibrin to build up the collagen and elastin in the massaged area. This in turn gives a younger, smoother look to the skin. If you really want to see a dramatic change in your skin, have a good massage every second day for three months while eating the right diet. • Apricots maintain youthful skin and regenerate your body’s fluids. Dried apricots enable every cellular structure in your body to hold proper amounts of moisture to maintain normal cellular function. Tammy Burak is a contributing author and copy editor at Amazing Discoveries. This article is adapted from Dr. Rudy Davis’ lecture "Our External Thermometer", which is part of a14-DVD series: "Healthy From Inside Out".